About 25 percent of the world’s population – don’t have access to safe drinking water, and an estimated two-thirds of the world’s population may face water shortages by 2025. In India, more than 81 percent of adults, well over the global average, say they have changed their behaviour as a result of water concerns. In concern with this major problem in the country, Ford has reduced the use of drinking water for their automation purposes, quite drastically. In 2016, Ford Asia Pacific claims that they have used 15 percent less water to produce each vehicle compared to 2015. Overall, the company has halved its water usage per vehicle in the region over the past seven years. The company states that they have saved 10 billion gallons of water from 2000 to 2015, a decrease of 61 percent – enough to fill over 15,000 competition-sized swimming pools. By 2020, Ford has targeted a water usage reduction of 72 percent when compared to 2000. 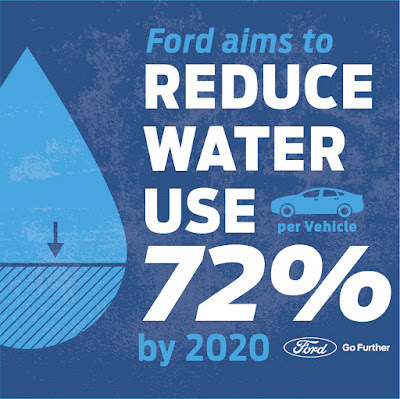 That roughly means for every one gallon of water Ford used in manufacturing in 2000, it aims to use about one litre by 2020. The plants in Chennai, have achieved zero liquid discharge and have also installed equipment to harvest rain water to further reduce the use of drinking water. 3,000 cubic meters of rainwater was harvested for use in 2016. 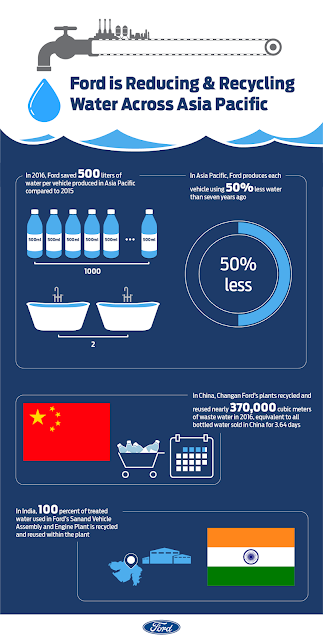 At Ford’s Sanand Vehicle Assembly and Engine Plant, 100 percent of treated water is recycled and reused within the plant property. These figures are quite staggering considering the water wastage in rest of the sectors across the country. According to the company’s policy in 2016, they have contributed more than US$340,000 to projects in Thailand, China, India and several other countries to provide communities with access to clean water, to protect or restore water management systems, and to educate future generations about the importance of one of our most precious natural resources. In India, Ford’s partnership with the Rotary Club and the Environmentalist Foundation of India included project funding of more than US$70,000 over the past three years, to help protect water storage and management systems damaged by heavy flooding in Chennai. Due to all their efforts in conserving this vital natural resource, the company has also been awarded as one of the World’s Most Ethical Companies by the Ethisphere Institute for the eighth year in a row – the longest streak for any auto manufacturer.